The Mendoza province sits in the western-central region of Argentina, just over 600 miles (1,000 kilometers) west of Buenos Aires. The province shares a border with the provinces of San Juan, San Luis, La Pampa and Neuquén. Its capital is also Mendoza, a city famed around the world for its vineyards and wine production. The western edge of the province shares a natural border with the Andes Mountains; Santiago de Chile (Chile’s capital city) is about 235 miles (380 kilometers) further west. Spanish conquistador Pedro del Castillo established Mendoza in 1561 and for a little over 200 years it belonged to the General Captaincy of Chile, which was a colony of the Spanish Empire. Following the creation of the Viceroyalty of the Río de la Plata in 1776, Mendoza became part of an area known as Cuyo de Córdoba del Tucumán. This region then separated to form the Cuyo Province, in 1813. General José San Martín was Cuyo’s first governor and from Mendoza, in 1817, he led an army across the Andes in a successful bid to liberate Chile from Spanish rule. By 1820, the Cuyo Province had divided to form the individual provinces of Mendoza, San Juan and San Luis. Today, these provinces, along with La Rioja, are still commonly referred to as the Cuyo region. Prior to European settlement, the Mapuche and Puelche indigenous groups inhabited this region. In fact, the province’s earliest human traces date back over 10,000 years. The low-lying plains and continental climate make the province of Mendoza an idyllic wine-producing region. In fact, it produces over two-thirds of Argentina’s wine. Visit the city of Mendoza to take tours of the nearby bodegas and sample Malbec, Merlot and other grapes. Find more bodegas in Maipu and the Valle de Uco. Visit lesser-travelled Chacras de Coria to enjoy countryside bike rides, cooking classes and, you guessed it, further wine tastings. For the active traveler, there’s the opportunity to trek to the summit of Aconcagua, which is the highest mountain peak in the Americas, and go white-water rafting. You can even go skiing at Las Leñas ski resort, one of the largest Andean resorts in Argentina. The Mendoza region is pleasant to visit all year round. The summer months, from mid-December to late-February, are both the high season and hot season. Expect temperatures of over 90°F (32°C) during the daytime and mild nights of 59-64°F (15-18°C). Don’t be surprised if the days hit the 104°F (40°C), either. The end of summer is harvest time, when the grapes reach full ripeness. Late spring (October to mid-December) and autumn (April to June) offer cooler temperatures and generally fewer tourists. Autumn is particularly agreeable as, with the change of the season, the countryside becomes a blanket or orange and red. Winter temperatures range from 35-57°F (2-14°C). While mornings can be cold, clear skies and sunshine make afternoons enjoyable. The ski season runs from mid-June to October. Mendoza is a low-lying city spread across the valley of the Río Mendoza and in the foothills of the Andean mountain range. It takes its name from Garciá Hurtado de Mendoza, who was a Spanish soldier and the former Governor of Chile. Mendoza is arguably the most aesthetically pleasing destination in Argentina, which is the result of a complete redevelopment after an earthquake flattened the city in 1861. The large squares and wide avenues of the city center were specifically designed to provide easy escape routes should the city get hit by another serious earthquake. Situated in a desert area and receiving fewer than 10-days of rain per year, Mendoza is surprisingly green. Lining the streets are rows of trees that provide essential shelter during the hot summer days. The notable greenery is a consequence of an artificial irrigation system, which waters the trees and also creates a natural cooling system. Irrigation in the region dates back to the per-Hispanic era, and the early Spanish settlers saw an opportunity to plant vineyards throughout the region. Wine has been sold from Mendoza since the early 18th-century and today the city is synonymous with wine-production and wine tourism in the form of bodega tours and tastings. Today, Mendoza is one of the most popular year-round tourist destinations in Argentina and from here you can travel to just about anywhere in the country. The Terminal del Sol (cnr Av. Videla and Acceso Este) is the central bus station, situated about 10 blocks from the city center. It’s on the corner of busy freeway so you’re best bet is to get a taxi rather than walk. 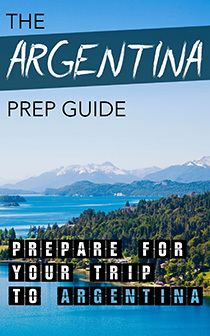 Among other destinations, buses connect with Bariloche (18 hours), Buenos Aires (15 hours), Córdoba (11 hours), Neuquén (12 hours) and Tucumán (15 hours). There’re also international bus services to Montevideo (21 hours), Santiago de Chile (8 hours) and Lima (60 hours). In the winter months, services to Chile are dependent on the weather conditions. Check Plataforma10 for further destinations and timetables. Alternatively, Mendoza has an international airport – Francisco Gabrielli International Airport – that receives regular flights from Buenos Aires and Santiago de Chile, as well as Córdoba, Iguazú Falls, Rosario and Salta. The airport is about 5.5 miles (9 kilometers) north of the city center. See Aerolíneas Argentinas, LAN and Sol for ideas of prices. While wine tourism takes top billing in Mendoza, we will discuss this further on. Meanwhile, Mendoza is an interesting and relaxing city to explore. The main sights sit scattered around five central squares, whose positioning resembles the number five on a dice. The centerpiece square is Plaza Independencia, with Plaza Chile, Plaza San Martín, Plaza Italia and Plaza España sat two blocks from each of its four corners. Each of the squares has its own unique appeal. In the heart of Plaza Independencia is a large fountain, Fuente de la Bandera, several pergolas and plenty of grassy areas to sit and relax. The square hosts a daily handicrafts market – Feria de Artesanos – with up to 150 different vendors. It starts at 4 p.m. on weekdays and 11 a.m. on weekends. On the square’s surrounding streets are two of Mendoza’s best theaters, Teatro Independencia (Chile) and Teatro Quintanilla. The latter is in the square’s basement and accessed from Espejo street. Also in the basement is the small Museum of Modern Art, which hosts rotating art exhibitions and free concerts. Go to Plaza San Martín to see the Basílica de San Francisco (Av. España 1418), which dates to 1875. Look for the image of the Virgin of Cuyo. The virgin was the patron saint of San Martín’s army that crossed the Andes in 1817. There’s also a tomb that holds the remains of San Martín’s daughter and her family. Of the other squares, Plaza España is the most attractive. Check out the mosaic-tiled fountains and benches, as well as a mural that portrays scenes from Mendoza’s history. History enthusiast should head to the Museo Fundacional (cnr Videla Castillo and Beltrán), on the corner of Plaza del Castillo. It protects the ruins of Mendoza’s former cabildo (administrative office), destroyed by the earthquake of 1861. You’ll also find a chronological display of Mendoza, from the pre-Hispanic era to independence. Nearby, on Ituzaingó street are the ruins of a Jesuit church and school. You can walk here in under 30-minutes from Plaza Independencia. Don’t miss Parque San Martín (Main entrance: cnr Av. Emilio Civit and Av. Boulogne Sur Mer), which is a 30-minute walk west from Plaza Independencia. Carlos Thays, the revered French-Argentine landscapers, designed the park in the 1890s. Today, it’s a great place to stroll along the 11 miles (17 kilometers) of pathways and relax on sheltered lawns. Check out the Rose Garden on the north side of the park’s lake. It has around 500 species of roses. Kids can enjoy horseback rides or spotting over 1,000 animals in Mendoza Zoo. Soccer fans might like to visit Estadio Malvinas Argentinas, built especially for the 1978 World Cup. If you are feeling energetic, hike to Cerro de la Gloria. The summit is 3,149 feet (960 meters) above sea level and presents panoramic views of the city. Running east and west from Plaza Independencia is Avenida Sarmiento, a pedestrianized street lined with café and restaurants, many of which have sidewalk seating areas. Try Azafran (Sarmiento 765), a mid-range priced restaurant with an elegant and authentic ambience. A sommelier is on hand to help you select the best wine to go with your meal. Nearby, Ceibo (25 de Mayo 871) specializes in Argentine fare and its empanadas cooked in a clay oven are certainly worth visiting. You’ll find the restaurant on the edge of Plaza Italia. Go to the NH Hotel to find Cordillera (Av. España 1324), which does a good executive lunch (set menu). The menu consists of Mediterranean takes on local and international dishes. Meanwhile, Siete Cocinas (Av. Bartolomé Mitre 794) serves an excellent range of fish and meat dishes; give the rabbit cannelloni a try. If you are traveling with kids then stop by Il Panino (Paso de los Andes). It offers a good range of pizzas and sandwiches, and has a children’s playroom to keep the young ones occupied. It’s a convenient place to stop after visiting Parque San Martín. For budget dinners and set menus, take a walk along Avenida Las Heras and Avenida San Martín. The Mercado Central (cnr Av. Las Heras and Patricias Mendocinas) should not be missed. Not only is it where locals shop for fresh produce but it’s also a superb place to grab a pizza or sandwich, some empanadas or even a steak. Mendocinos, like many Argentines, are crazy about ice cream and all over the city you’ll find heledarías (ice cream parlors). Ferruccio Soppelsa (various city locations) is particularly good and a firm local favorite. Italian immigrants started the business in 1927 and continue to impress with a multitude of flavors, such as tiramisu, mascarpone with forest fruits, and even vanilla with Malbec. Mendoza’s principal drinking and party scene takes place along Avenida Villanueva Aristides. The street runs from the east side of Parque San Martín to one block south of Plaza Italia. There’re abundant bars to choose from so your best bet is to stroll around until you see an establishment to your liking. Worth checking out is La Lucia Grill Bar (Av. Villanueva Aristides 290). It’s a lively parrilla (steakhouse) that doubles up as a late-night bar. On the same block is Bar Latina (Av. Villanueva Aristides 245), which has great cocktail-happy-hour and puts on regular live music. For craft beer brewed onsite, drop into Antares (Av. Villanueva Aristides 245). You might feel obliged to drink wine when in Mendoza but the beers here are excellent and offer a change from Quilmes. Later into the night, hit Mini Moog (Av. Villanueva Aristides 426). Expect DJs spinning electronic music and party-goers dancing until dawn. There’s a wide range of cocktails to keep your energy levels up, as well. You’re almost guaranteed a lively night plus the chance to meet backpackers at Believe Irish Bar (Av. Colón 241). Whisky drinkers will appreciate the bar’s selection of single malts. The bar is one block south of Plaza España. Go to Vines of Mendoza (Av. Belgrano 1194) for wine tastings. One-hour tasting sessions take place from Tuesday to Saturday and include five different wines. It’s popular so book in advance. Find more information on tasting session on the English-language Wine Republic website. Bear in mind that accommodation prices increase from January to March, especially in March when the Fiesta Nacional de la Vendimia (wine festival: see below for more details) takes place. Hostel Mora (San Juan 955) is ideally situated halfway between Mendoza’s bus terminal and Plaza Independencia, therefore convenient for early morning departures. The hostel runs in-house cooking classes and wine tasting sessions, and puts on weekly barbecues. Another backpacker favorite is Mendoza Backpackers (San Lorenzo 19). It’s just one block from Plaza España and close to the main city sights and restaurants. The hostel has its own lively bar, and a travel agency that can help to organize wine tours and adventure activities. To get away from the backpacker crowd, try Bed and Breakfast Plaza Italia (Montevideo 685). It’s family-run and offers hotel comforts in a laidback environment. Casa Lila (Nicolas Avellaneda 262) is another family-run bed and breakfast, with only four en-suite bedrooms. Both places are happy to help with wine tours and tastings. For a treat, check in at the Villagio Hotel Boutique (25 de Mayo 1010). It’s a centric hotel with modern and comfortable rooms. Rates include a hearty breakfast, and the spa is perfect after a day of sightseeing. And, for no-holds-barred luxury, go all out and book a room at the Park Hyatt (Chile 1124). Set in a 19th-century colonial building, rooms have views of the city and surrounding valley. If you want to get away from Mendoza’s city center then consider staying at Chacras de Coria, a town just 8.5 miles (14 kilometers) south of Plaza Independencia. There’s a handful of tourist attractions, a noteworthy assortment of restaurants and some good guesthouses. It’s also a good base for taking trips to the wineries of Valle de Uco (see below). The focal point of town is Plaza General Espejo, which hosts an antiques fair on Sunday afternoons. Art enthusiast will enjoy the exhibitions of local and international work at the Museo de Bellas Artes – Casa de Fader (San Martín 3651). It’s named after French-Argentine painter Fernando Fader. Various buses run to the town from Mendoza’s main bus terminal. All of the following are worth checking out: Dantesco Restaurant (Italia 5829), for king crab sorrentinos or rabbit; La Piadina (Italia 5723), for big portions of Italian classics such as homemade pasta; and Clos de Chacras (Monte Libano 1025), a winery and family-friendly restaurant. Accommodation prices are more expensive here than in Mendoza itself but if you can afford a little extra then there’re some lovely places to stay. Almost all are set within large grounds and some offer views of the Andean mountain range. Try Hotel San Francisco (Pueyrredón 505), Posada Borravino (Medrano 2658) and Posada Olivar (Besares 5500), all of which have a restaurant, swimming pool, and bike rental. Casa Glebinas (Medrano 5505) is a little oasis surrounded by almost 2-acres (1-hectare) of parkland and fruit orchards. Accommodation is in the form of mini-apartments, each with a private patio or balcony. Lares de Chacras (Larrea 1266) is a boutique lodge with rustic furnishing; could be the spot if you’re looking for a few romantic days away. About 8.5 miles (14 kilometers) southwest of Mendoza’s center is the small city of Maipú. It’s the capital of a district characterized by sprawling olive fields and fruit orchards, including innumerable vineyards. Rather than running around in a desperate attempt to visit sights, people come to Maipú to soak up the laidback lifestyle that resonates from its leafy streets. They also come to eat and drink well. The city is in the heart of an important wine-growing region, thus is home to some excellent bodegas (see the wineries section), especially along Calle Urquiza. Regional buses run regularly from Mendoza city to the center of Maipú. Catch the 151 or 161 bus from either Mendoza’s bus terminal or at the corner of La Rioja and Catamarca streets. Ask to be dropped off at Plaza 12 de Febrero. This is Maipú’s main square, and a pretty one at that. At its heart is a fountain that lights up at night to illuminate the square. On the west side is a picturesque white-washed church, Iglesia la Merced. Take advantage of Maipú’s flat terrain by joining a bike tour and exploring the surrounding countryside along with some bodegas. Bikes and Wines (Urquiza 1606) organizes half and full-day tours, which include visits to both family-run and industrial bodegas. Horseback rides are also an enjoyable way to see the region’s countryside. Cabalgatas la Guatana (Maza Sur 8001, Lunlunta) arranges tours of vineyards on horseback, including wine tastings and a picnic. Many of the bodegas have their own restaurants. Worth checking out is Casa del Visitante (Ruta Provincial 33, Km 7.5) at the Familia Zuccardi bodega. In addition to a delicious tasting menu and expert wine pairings, the restaurant hosts art exhibitions and live music events. At the same location is Pan y Oliva, which is a Mediterranean-inspired restaurant offering tapas plus cheese and meat platters. At the bodega you can arrange cooking classes for both adults and children. 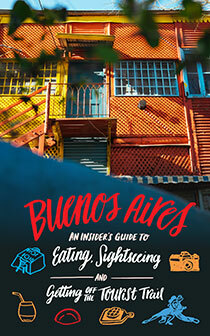 Other notable establishments include Pie de Cuba (Urquiza 800) and Restaurant Terruño (Ruta 60, Km 2.5). Pie de Cuba offers celiac (gluten-free) options. Rincón de López (Ozamis 375) is a centric restaurant that serves well-priced tasting menus with wine pairings. It is part of the Bodegas López and the seating area overlooks the vineyard. For drinks, try Bar de Moe (cnr Jujuy and Tropero), a bar named after the proprietor of Homer Simpson’s local watering hole. Jackie O Bar (cnr Emilio Civit and Maza) is a good spot for cocktails and live music, while the Black Jagger Club (cnr Emilio Civit and Maza) is a nightclub inspired by New York’s 1960s nightlife scene. You’ll find both at Arena Maipú, along with a casino and a handful of other bars and restaurants. The cheapest place to stay, which also includes an exceptionally warm welcome and help with excursions, is Hostel Wineries (Urquiza 2997). It’s more of a homestay than a hostel, but has all the essentials you need for a couple of nights. Huar Hostel (Dr. Brandi 47) is another budget hostel with a guesthouse feel. The five rooms, which sleep from two to four guests, are clean and comfortable, and there’s a barbecue on the patio. Posada Verde Oliva (Monte Caseros 5513) and Posada Cavieres Wine Farm are both well-appointed bed and breakfasts. Club Tapiz (Ruta 60m Km 2.5) occupies a historic late-1800s house surrounded by 25 acres (10 hectares) of vineyards. For affordable luxury, book a room at Tikay Killa (Monte Caseros 3542) Rooms are set around a quiet garden and rates include breakfast. According to experts, Valle de Uco is the finest wine region in Mendoza. Situated on the Tunuyán River around 55 miles (90 kilometers) south of Mendoza, it’s home to over 100 wineries, many of which have been set up by international investors. The average annual temperature of 57°F (14°C), more than 250 days of sunshine per year and altitudes that vary between 2,625 and 3,936 feet (800 and 1,200 meters) are what give this valley its revered grape-growing qualities. Consequently, this region of Mendoza features significantly on the Mendoza wine route. The traditional grapes grown here are Malbec and Semillón, with the latter being used to produce sweet white wines. Other grapes include Bonarda and Barbera, Cabarnet Sauvignon and Chardonnay, all of which can be sampled at the region’s bodegas. If not to visit the bodegas, Valle de Uco is definitely worth visiting for the day to take in the picturesque scenery and rural villages. Laguna del Diamante is a particularly impressive area. It’s a reservoir framed by Maipú Volcano. South Trekking (Adolfo Calle 4171, Mendoza) arranges daytrips and overnight hikes between mid-December and March. Notable bodegas here include Bodega la Azul (Ruta 89, Agua Amarga) and Bodega Salentein (cnr Ruta 89 and Videla, Los Árboles). La Posada del Jamón (Ruta 92, Km 14) is a must for ham lovers. The restaurant specializes in pork, and plenty of it. You can take a tour of the storing room and learn how to make cured ham. There’s even a little handicrafts shop to entice you to spend your pesos. And, if you eat too much pig then you can stay overnight in the posada (guesthouse). Be sure to stop by Tupungato Divino (cnr Ruta 89 and Calle Los Europeos), a restaurant affording panoramic of the Andes mountains. The chef uses vegetables hand-picked from the restaurant’s garden. Killka (cnr Ruta 89 and Videla, Los Arboles) is a modern restaurant at Bodega Salenstein serving locally-grown produce. After dinner you can wander around the winery and see art exhibitions at the onsite gallery. If you are in the village of Tupungato then Riguetto Café (Belgrano 542, Tupungato) is a good spot for a glass of wine. In Tunuyán, stop by Del Río Bar and Bistro (Ruta 92). There aren’t any backpacker hostels in Valle de Uco but if you want to escape into the country for a few days then there’re numerous lodges, many of which are associated with the valley’s wineries. La Posada del Jamón (Ruta 92, Km 14) is a great place to stay and offers rustic lodge-style rooms. The owners give tours of the vineyard and organic garden, and there’s plenty of entertainment for kids. Fuente Mayor Hotel and Resort (Ruta 92, Km 15, Vista Flores) sits in the foothills of the Andes mountains and presents unrivalled views. You can rejuvenate in the spa or have a flutter in the casino. Posada Salentein (cnr Ruta 89 and Videla, Los Arboles) is at the bodega of the same name and is an exclusive estancia with 16 luxury rooms. All rooms have views of the vineyard. The bodega is a complex that includes the posada, the Killka restaurant, an art gallery, swimming pool and chapel. Alternatively, check out Postales Boutique Hotel (Calle Taberna, Colonia de las Rosas), which is in the heart of the valley and a 10-minute drive from Tunuyán. The rooms sit around a swimming pool that looks out towards the mountains; the perfect setting for breakfast or a bottle of wine. Bodega Dolium (Ruta 15, Km 30, Agrelo, Luján de Cuyo). This is a small family-run bodega. They store the wine in amphoras, which are the bottles used by Greeks and Romans in classic wine-production. Opened in 1997, it was the first Argentine bodega to use underground wine-storing techniques. The owners run the tours, thus adding both a personal and family touch to your visit. You can also personalize your tour to include tastings of your preferred wines. There’s an option to have lunch with the owners, which includes a tasting of six wines. Luigi Bosca (San Martín 2044, Mayor Drummond, Luján de Cuyo). Established in 1901, this bodega is managed by the third and fourth generations of the Arizu family. Tours strive to take visitors through all the stages of wine-making, from the cultivation of the grapes to grape crushing and barreling. After a tasting session, you can visit the bodega’s art gallery to enjoy the ‘Wine Way of the Cross’ by local artist Hugo Leytes. It portrays the history of Mendoza’s wine industry. Luigi Bosca presides over seven wine farms situated in the Mendoza province. One of its biggest sellers is the Finca la Linda brand, which is readily available in shops throughout Argentina. Fabre Montmayou (Roque Saenz Peña, Vistalba, Luján de Cuyo). Opened in 1992, Fabre Montamyou is a French-owned bodega with almost 220-acres (90-hectares) of vineyards. The main varietals are Malbec, Cabarnet Sauvignon, Chardonnay and Merlot. Tours, by appointment only, are given in English, French, German (upon prior request) and Spanish. After a tour you can enjoy a ‘make your own blend’ activity where you meet with a sommelier and have a go at making your own wine. Foodies will enjoy the wine and cheese pairings. Bodega la Rural (Montecaseros 2625, Coquimbito, nr Maipú). Italian Philip Rutini opened this bodega in 1885, making it one of the oldest in Argentina. It produces the prestigious Rutini wines. The bodega has a capacity to store up to 10-million liters of wine, and it exports over 1-million cases of wine per year. The 45-minute tours include a visit to the vineyard and bodega, wine tasting and a tour of the Museo del Vino (Wine Museum). The museum is home to a 4,500 items relating to wine-making, such as tools and machinery, vintage bottles, books and catalogues. During the summer months you can enjoy a gourmet wine and food pairing meal. Finca Flichman (Munives 800, Barrancas, Maipú). In 1873 Polish immigrant Sami Flinchman settled in Maipú and set up this winery, which opened in 1910. Tours take in parts of the bodega that date back to 1873, the bottling area and then culminate with tastings of fine wines. The bodega has three other sites in Mendoza, which collectively produce 24,000 liters of wine per hour. The view of the Andes from the vineyard is spectacular. Viñedos y Bodega La Agrícola (Ruta 33, Km 7.5, Fray Luis Beltran, Maipú). Alberto Zuccardi, an Argentine of Italian descent, opened this bodega in 1963. It’s famous for the production of the Santa Julia brand of wines, one of the most commonly seen in Argentina. It also produced Argentina’s first Ultra Premium wine made from the Tempranillo grape, Zuccardi Q Tempranillo 1997. Through the Casa del Visitantes, the bodega arranges a variety of tours, including a bike and tasting tour, tours in classic cars, and picnics. The restaurant puts on regular art exhibitions and live music events. Bodegas López (Ozamis 375, General Gutiérrez, Maipú). This bodega is in the heart of Maipú and offers free guided tours that include a wine tasting; enjoy more tastings for an extra charge. Visit both the classic wine-making plant and a plant used for producing sparkling wine. There’s also a small museum with some interesting exhibits, such as old vehicles and equipment. To visit the bodega’s vineyards you’ll need to book 48-hours in advance. True wine enthusiasts can sign up for sommelier and tasting courses. Bodegas Valentin Bianchi (Ruta 143 and Calle Valentín Bianchi, Ciudad de San Rafael). This is one of the most visited vineyards in the Mendoza region. It’s popular for both the wines and unrivalled views of the Andes. Walking and bike tours traverse the vineyards and visit the production rooms before finishing with mandatory tastings. There’s a huge onsite shop to tempt you to take home a bottle or two of what you’ve just sampled. Ask about gourmet food evenings. Bodegas Navarro Correas (San Francisco del Monte, Godoy Cruz, Mendoza). This winery dates back to start of the 19th-century when Juan de Dios Correas planted his first grapevines in the foothills of the Andes. It’s a classy looking bodega complete with a swanky wine bar and exhibition space for traveling art displays. Check the website for different tasting options, which include three to four varieties of wine. Chandon (Ruta 15, Km 29, Agrelo, Luján de Cuyo). Visit the bodega of the Argentine branch of one of the world’s most well-known producers of sparkling wine. Tours explain the history of sparkling wine and the process of producing it. Tastings include up to six varieties of sparkling wine and can be paired with cheese boards or food tasting menus. As there are so many bodegas to choose from in the region, what many do is join a tour that visits between two and six bodegas in one day. You could also rent a car a go independently, but you won’t be able to consume as much wine if you are driving. Try companies like Ampora Wine Tours (Sarmiento 647, Mendoza), Trout and Wine Tours (Espejo 266, Mendoza) and Uncorking Argentina (Belgrano 1093, Mendoza). All arrange half and full-day tours with bi-lingual wine experts. Alternatively, explore the region on a bike; just be careful on the way home if you’ve had your fair share of wine. Mr. Hugo is a local chap who runs Mr Hugo Wineries and Bikes (cnr Catamarca and Rioja, Mendoza). He’ll take you on a day-tour of numerous wineries plus visits to an olive oil farm and chocolate factory, if requested. Mendoza Wine Bike Tour (Espejo 65, Mendoza) is another independently-run bike tour offering a similar service to Mr. Hugo. If you happen to be around during the first week of March then you’ll be able to enjoy the Fiesta de la Vendimia. This festival celebrates the grape harvest and just about everything else associated with Mendoza’s wine-making heritage, including plenty of consumption. In addition to wine tasting, you’ll be able to sample local cuisine and enjoy folkloric music and dance performances. On the Friday night, festival-goers head to the Frank Romero Day Amphitheater in Parque San Martín for the presentation of the festival queen contestants. Then, on the Saturday there’s a procession followed by the crowning of the queen. Ask at your hostel or hotel about tickets for this event. Otherwise, hang around Plaza Italia, where a big screen broadcasts events and the local wineries circulate with free samples. Tear yourself away from the delights of Mendoza’s bodegas and look in a westerly direction and you might notice a rather impressive snow-capped mountain. This is Aconcagua, which at 22,837 feet (6,960 meters) above sea level is the tallest mountain peak in the Americas. Sat on the Chilean border, it is part of the Andes mountain range and is the focal point of the 175,445-acre (71,000-hectare) Parque Provincial Aconcagua. If you’re interested in climbing to the summit then you can find information and routes on Aconcagua.com. Plan a minimum of 15-days to reach the summit and return to Mendoza. If going independently then you need to purchase a permit, which is obtainable at Mendoza’s tourist office (San Martín 1143). Mendoza has an abundance of tour operators that run treks to Aconcagua’s summit. Try Inka Expediciones (Juan B Justo 345) and Aconcagua Trek for an idea of itineraries and costs. Alternatively, Aymará Adventures and Expeditions (9 de Julio 1023) do helicopter flights to the summit, as well as treks. You don’t need to scale a mountain to hike in the Mendoza region, either. Discover The Andes (Guaymalle, Mendoza) runs one-day hikes in addition to mountain biking and horseback riding excursions. Colangüil (San Martín, Las Vegas Potrerillos, Luján de Cuyo) offers a similar range of treks. When booking a hike or trek, check with the tour operator that they will prearrange any necessary permits. Some of Argentina’s best white-water rafting locations are in the Mendoza province, with rapids varying from grade II to V. The best time to go is in the summer months, after the snow melts and fills up the Río Mendoza. Potrerillos, which is 33 miles (53 kilometers) west of Mendoza city is a particularly good rafting hub and two reputable companies operating trips here are Potrerillos Explorer (Av. los Condores, Potrerillos) and Argentina Rafting Expediciones (Amigorena 86, Mendoza). Contact the latter for alternative excursions, such as zip-line, abseiling, horseback riding and paragliding. Around 310 miles (500 kilometers) southwest of Mendoza is the ski resort of Las Leñas. It’s kind of a skiing party for wealthy Argentine’s – the resort has a host of restaurants, bars and nightclubs – yet not completely out of reach for lower-end travelers. Open from July to October, there’s 43,244 acres (17,500 hectares) of skiable surface, which includes 29 pistes, a freestyle snow park and slalom area. Lessons are available for all levels and there’s a shop from where you can rent/buy clothing and equipment. You’ll find 18 restaurants at the resort; three on trails and 15 at the base. There’s everything from pizzerias and Tex-Mex to steakhouses and buffet restaurants. After dinner you can hit the bars and nightclubs, most of which are part of the resort’s hotels. The clubs generally get going around 1 a.m. and continue until 6.30 a.m., giving just enough time for a quick sleep before getting back out on the slopes. The resort also counts on seven hotels plus self-serviced apartments that sleep up to eight people. See the Lodgings section of the resort’s website. If you don’t want to fork out the higher prices of Las Leñas’ hotels then consider staying in Malargüe, which is 44 miles (70 kilometers) away. Hostel City Malargüe (Av. Rufino Ortega 158) is set up for backpackers and budget travelers, and operates a shuttle service to Las Leñas during the ski season. Nord Patagonia Hostel (Fray Inalicán 52) is another good budget option, which can help with arranging rafting, horseback riding, trekking, and other tours. While in Malargüe visit the Planetario (Comandante Rodriguez 207) or ask at your hotel about trips to Cavernas de las Brujas in Reserva Provincial La Payunia. It’s about a 6-hour drive from Mendoza to Malargüe and almost 2-hours from town to Las Leñas. We would like if you can recommend our adventure services in Mendoza in your web site , we have a variety of trips and exclusive services for foreigners looking for something cool in the Andes ! We would love to appear in your web site and keep in touch with your guide , if you have any question please let us know . have an nice day !